For many years, dietary fat has been unfairly villainized as the cause of a slew of chronic diseases, including obesity, diabetes, and heart disease. During the heyday of the low-fat craze in the 1990s and early 2000s, medical authorities urged us to banish fat from our diets. Unfortunately, epidemiological research indicates that this dietary shift did not make us any healthier; in fact, it may have worsened many of the conditions it initially sought to reverse. The truth is that the body requires healthy fats to carry out many crucial biological processes. Healthy fats are needed for proper hormone production and detoxification. Read on to learn how healthy fats benefit hormones and detoxification and how you can incorporate more healthy fats into your diet. All fats are not created equal. While it is true that some fats, such as man-made trans fats, are harmful to our health, other fats serve essential functions in the body. To understand why some fats are healthier than others, it helps to understand the chemical structure of fats. Fats are chains of carbon atoms bonded to hydrogen atoms. The length and shape of the carbon chain and the number of hydrogen atoms connected to carbon atoms create different structures; these structures translate into differences in form and function among various fats. Man-made trans fats are created when industrial seed oils, such as soybean and safflower oil, undergo a process called hydrogenation. Hydrogenation heats the oils to high temperatures in the presence of heavy metal catalysts, adding more hydrogen atoms to the carbon chain; this process turns the fatty acids into rigid, kinked structures that damage blood vessels and cell membranes and are highly inflammatory. Trans fats are ubiquitous in margarine, baked goods, and other processed foods. 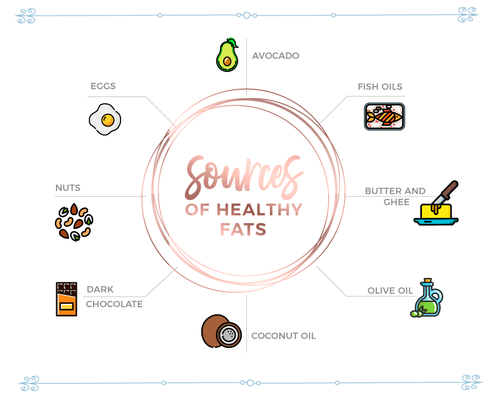 Healthy fats, on the other hand, include the naturally-occurring monounsaturated fatty acids, certain types of saturated fats (such as those found in coconut oil and pastured butter), and omega-3 and omega-6 fatty acids. While monounsaturated and saturated fatty acids have their place in a healthy diet, I'd like to focus specifically on the roles of omega-3 and omega-6 fatty acids, as these fats play vital roles in hormone production and balance, and in detoxification. Omega-3 and omega-6 fatty acids are polyunsaturated fatty acids; the numbers 3 and 6 in their names refer to the location of the double bond within their carbon/hydrogen structures. The body cannot make omega-3 and omega-6, thus necessitating the consumption of these healthy fats in our diets. In contrast to trans fats, omega-3 and omega-6 fatty acids are anti-inflammatory. Their anti-inflammatory effects stem from their crucial roles as precursors in the creation of prostaglandins. Prostaglandins are lipid compounds that play roles both in the initiation and reduction of inflammation. While inflammation is a normal physiological process in the body, excess inflammation causes a variety of health problems, including hormone dysregulation. In fact, a growing body of research indicates that hormonal issues have an inflammatory component caused by an imbalance between pro-inflammatory and anti-inflammatory prostaglandins. Hormonal issues associated with a prostaglandin imbalance include premenstrual syndrome, polycystic ovary syndrome (PCOS), and hot flashes and osteoporosis associated with menopause. (1)(2)(3) Omega-3 fatty acids and specific omega-6 fatty acids can help correct these conditions by promoting the production of anti-inflammatory prostaglandins that reduce inflammation. ALA comes from plant sources, including flaxseed oil, chia seeds, and walnuts. EPA and DHA come from wild seafood, fish oil, and pasture-raised eggs and meats. ALA can be converted into EPA with the help of an enzyme called delta-6-desaturase. EPA, in turn, can be converted into prostaglandin E3 (PGE3), an anti-inflammatory prostaglandin. A high intake of healthy omega-3 fatty acids can help suppress the formation of pro-inflammatory prostaglandins such as PGE2, discussed below. Conversely, omega-6 fatty acids from avocados, almonds, brazil nuts, pistachios, pecans, pine nuts, sunflower seeds, organic organs meats, borage oil, evening primrose oil, flax oil, olive oil, hemp oil, and spirulina are very healthy and can help reduce inflammation. As with omega-3 fatty acids, omega-6 fatty acids are precursors to prostaglandins. The omega-6 fatty acids include linoleic acid (LA) and gamma-linolenic acid (GLA). LA can be converted into dihomogamma-linolenic acid (DGLA), a precursor to both PGE1, an anti-inflammatory prostaglandin, and PGE2, a pro-inflammatory prostaglandin. Both PGE1 and PGE2 are needed in the body; however, higher levels of PGE2 are associated with inflammation and hormonal problems such as dysmenorrhea and premenstrual syndrome. We can optimize our hormones by choosing to eat omega-6 fatty acids that balance PGE1 and PGE2 in the body. Consuming an optimal balance of omega-3 and omega-6 fatty acids in your diet can help balance the production of pro-inflammatory and anti-inflammatory prostaglandins in the body and resolve symptoms of hormonal imbalances. In fact, supplementation with omega-3 and omega-6 fatty acids have already been found to improve symptoms of PMS, premenstrual syndrome, and menopause! Polycystic ovary syndrome (PCOS) is the most common hormonal abnormality in reproductive age women. It is characterized by elevated androgen levels and insulin resistance, both of which can exacerbate imbalances between pro-inflammatory and anti-inflammatory prostaglandins. Research indicates that omega-3 fatty acids help reduce symptoms of PCOS and restore hormonal balance by reducing inflammation. Up to 80 percent of women report experiencing symptoms before menstruation, including irritability, bloating, migraines, and breast pain. (7) Furthermore, 25 to 50 percent of women and 75 percent of adolescents experience pain with menstruation. (8) These uncomfortable and in some cases debilitating phenomena are called premenstrual syndrome (PMS) and dysmenorrhea, respectively. Many features of PMS and dysmenorrhea may be attributed to imbalances in pro- and anti-inflammatory prostaglandins. For example, research has found that women with dysmenorrhea and PMS have a reduced conversion of GLA to DGLA in their bodies, resulting in abnormally low anti-inflammatory prostaglandin production. However, supplementation with healthy fats like omega-3 and omega-6 fatty acids can help promote anti-inflammatory prostaglandin production and alleviate symptoms of both PMS and dysmenorrhea. Many menopausal women are plagued by uncomfortable symptoms, including hot flashes and bone loss. Fortunately, several dietary oils can help reduce these symptoms and improve quality of life throughout a woman's menopausal years. We don’t often associate our fat intake with the health of our breasts, but it turns out that omega-3 and omega-6 oils can help promote healthy breast tissue! Clearly, healthy dietary fats play essential roles in female hormone health! However, the benefits don't stop there; healthy fats also assist with detoxification, a collection of biochemical and physiological processes that help maintain hormone balance and eliminate hormone-disrupting toxins from the body. The processes of detoxification help the body achieve a balance between hormone production and elimination and usher hormone-disrupting toxins out of the body. Healthy fats help support detoxification through several mechanisms. One of the most important routes of toxin elimination from the body is via the colon. Healthy fats, such as flaxseed oil and sesame oil, lubricate the colon and promote bowel regularity, thus speeding up the elimination of excess hormones and hormone-disrupting compounds from the body. The liver is the body’s primary organ of detoxification. It converts toxins into water-soluble forms that they can be excreted in the urine and stool. Omega-3 fatty acids help protect the liver from oxidative damage induced by environmental toxins such as heavy metals. (23) They also support the regeneration of cell membranes that have been damaged by bacterial toxins. (24) Omega-3 fatty acids thus help protect our primary organ of detoxification and ensure that it can carry out its essential functions. As you can see, healthy fats deserve a significant place in our diets! By balancing anti-inflammatory and pro-inflammatory prostaglandins and protecting our organs of detoxification, omega-3 and omega-6 oils can help balance our hormones and optimize our detoxification systems. There are many omega-3 and omega-6 fatty acid supplements on the market, and navigating the available options can be overwhelming! There are, rightly, many concerns over fish oil safety and quality, as many brands are garbage. But high-dose fish oil in a liquid form has quelled both inflammatory flare-ups and viral attacks for me very quickly. Wiley’s Wild Alasken Fish Oil is the highest quality healthy fat supplement I can find, which is why I chose to carry this one in my shop. If you struggle with hormonal imbalances or gut issues (or both! ), be sure take our "Is a Gut Infection Causing Your Hormonal Imbalance" quiz here, to investigate your own signs and symptoms!